3. SKYVVA Integration Suite – Installation? 4. What is an integration and how to create it? 5. What is an interface and how to create it? 7. How to use mapping? How to use formulas in mapping? 8. How to upload Account Data using manual Load? 9. How to import flat xml file? 11. How to use message reprocessing? 11.1 How to do Invoke callout mode Auto use only 10 callouts per transaction? 11.2 What is “Don’t Persist Message” and how to use it? 12. How to use workflow? 12.1 How to use formulas in workflows? 13. What is hierarchical interface? 13.2 How to create hierarchical interface using Foreign Key and how to use tree mapping concept? 13.3 How to upload account, contact and asset data in a CSV file in a step according to Salesforce? 13.4 How to import hierarchical xml file? How to use batch processing for inbound interfaces? How to speed up batch processing? How to use bulk processing for inbound interfaces? What is the difference between the bulk mode supported in Skyvva? 16. When to use synchronous, batch or bulk interface? 18.1 What is CDC and how to configure it? 18.2 How to create change record using Process Builder? 19. How to configure Alerting? 20. How to configure Message and logs deletion? 22. What is message type? 22.1 How to use message type? 22.2 How to create message type, for example:using WSDL or XSD…? 22.3 How to create free defined message type? 22.4 How to process message type based Interface? 22.5 How to create Trigger on MsgTypeRel? 22.6 How to Import file (XML,XSD,JSON,JSON Schema,) in the to create Message Type and IStrucutre to support the new logic? 25. How to use streaming api with Agent? 26. How to create an adapter in Agent? 27.2 How to use file and ftp/sftp adapter? 27.3 How to use eMail adapter? 27.4 How to use HTTP adapter? 27.5 How to create SOAP interface using the SOAP adapter? 27.6 How to create REST interface using REST adapter? 28. What is an external Id and how to use it to handle correct data update with an interface? 29. What are the differences between the mapping mode ‘External’ and ‘Mapping’ inside Skyvva? 31. What is an interface group and in which case is it used? 33 .What are queues and where is it used? 35. How to upload hierarchical xml into Salesforce using the Data Loader? 37. How to do Hierachical mapping? 38. How to use Automated Report? 39. How to do invoke callout using Queueable mode? 41. How to Export data without header for Agent component ? 41.1 How to Export CSV file without quotes using the Agent ? 42.2 How to export parent-child data from Salesforce to write xml file using Agent ? 43. 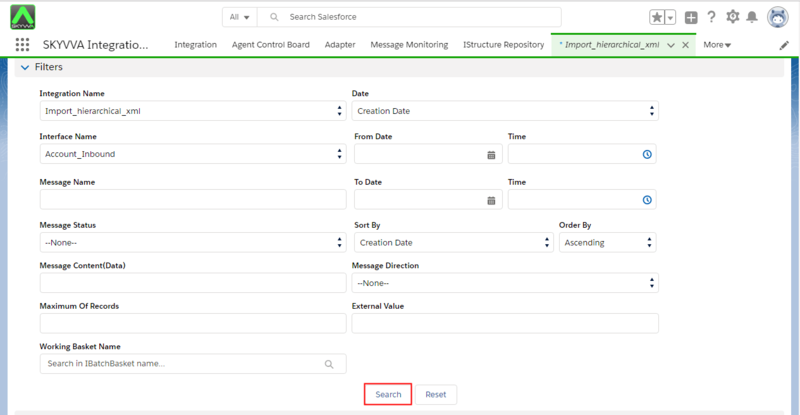 How to Import XML file Agent to Salesforce ? 43.1 How to import hierarchical xml using Agent ? 43.2 How to import hierarchical xml using manual load? 44. How to Import Attachment file Agent to SF & Export Attachment file SF to Agent ? 45. How to import hierarchical data using xml and csv file? 46. What is the Auto-Switch mode and when to use it? 47. 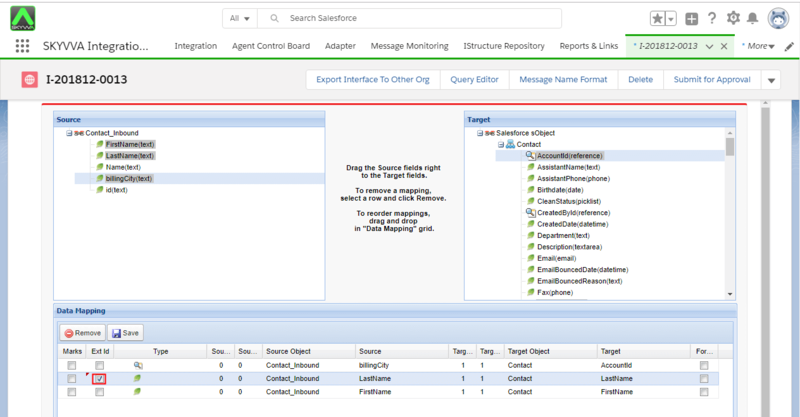 How to build real-time outbound interface? 48. What to do after a instance refresh? 49. How to Uninstall SKYVVA Agent? SKYVVA’s Data loader is a SKYVVA’s tool that user can upload file csv, xml to SFDC like manual load or mass manual load tools.To import hierarchical xml data User have to create hierarchical interfaces. To arrange interfaces in order means hierarchical interface. It is structure in which interfaces are ranked according to levels of important. In hierarchical Interfaces, one interface is a parent’s of other interface. It means that child interface inherited External ID from its parent’s interface. 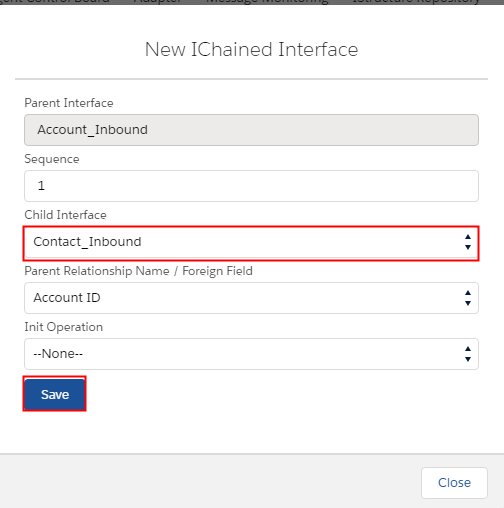 For example, Account interface is parent’s contact interface because of Contact inherited External ID from Account. Also One parent interface can have many child account but child interface has only single parent interface. eg. one Account can store many Contacts, but one Contact can’t store many Accounts. 1. Create hierarchical relationship between account and contact interfaces. 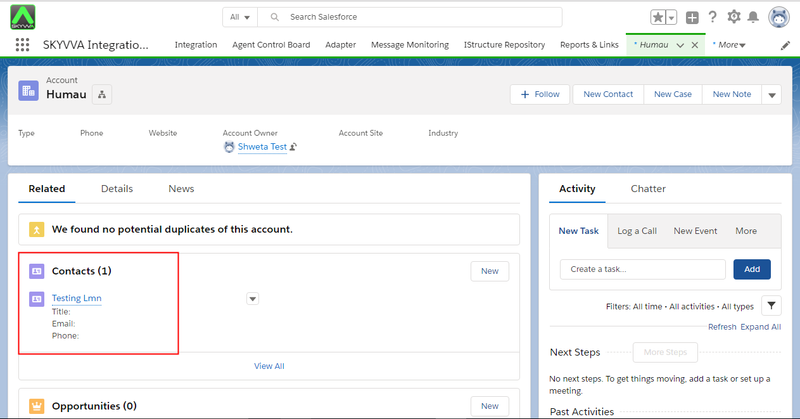 Login with your Salesforce organization. Select ‘Integration Tab’ and Create Integration. Enter valid name to name field to create integration which can able to recognize your integration. All Interfaces are created successfully . Browse XML file to generate IStructure. Select the Lookup Field as AccountId. Note: User can Create hierarchical interface using VLOOKUP and Foreign key. If you have a master/detail or lookup field between parent and child then you should go for foreign key to link them together. To upload data manually you have to use our manual load feature. When you have limited data you can upload it using manual load. Select detail tab from your integration and select Manual load option. 3. Check imported data on message monitoring. Go back to your Org. ← 43.1 How to import hierarchical xml using Agent ?